Jackson Figure Skates was founded by Donald Jackson (winner of the 1962 World Figure Skating Championships) and his brother Bill Jackson in 1966. Together with the Bauer Skate Company they developed a line of figure skates which now are worn by figure skaters all over the world. Jackson Skates has become a leading brand for lightweight performance in Figure Skates. 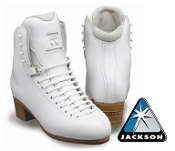 Most Jackson figure skates and figure skate boots are heat moldable to help reduce the break-in time. They have a rounded toe box, a medium-high instep, and a medium width heel. Jackson Skates has helped skaters from beginners to elite achieve their skating dreams. Jackson skates are highly regarded in Canada as well as all over the world for the figure skates of choice. They are world by elite figure skaters all over the world. Jackson skates are worn by Olympians, Synchro teams, Professional skaters and coaches recommend them above all other skates. for Jackson Ice Skates and Figure Skating Boots. Boys Jackson Figure Skates have been the leading figure skate for boys who want to achieve their skating dreams. Girls Jackson Figure Skates. Jackson is the leading brand of girls figure skates. From beginner skaters to advanced skaters, Jackson figure Skates has the right model to fit your skating level. Mens Jackson Figure Skates and mens jackson figure skating boots are a great choice for skaters from beginners to the more advanced. Womens Jackson Figure Skates and womens jackson figure skating boots are the choice of many ladies skating champions. Jackson is one of the worlds best figure skate manufacturers. They make high quality figure skates from recreational skates for beginner skaters to advanced skates for the more elite skaters. Kinzie's Closet carries a wide variety of the best Jackson Figure skates on the market. Most all Jackson skates are heat moldable to cut down the break-in time. The Jackson Mystique, Jackson Excel, Jackson Artiste are great for beginner skaters. They are high qualtiy skates that aren't too stiff but provide adequate support for those learning to skate and come with the figure skating blade already attached. The Jackson Marquis, Jackson Freestyle Fusion, Jackson Debut Fusion are made for intermediate skaters who are working on jumps and trying out new tricks on the ice. They also come with a more advanced blade with bigger toe picks. 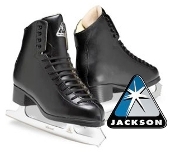 The Jackson Premier, Jackson Elite, and Jackson Elite Supreme figure skate boots are for the more advanced figure skaters doing double and triple jumps. 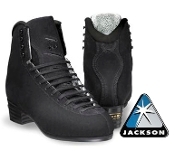 The Jackson Debut is also a great boot for intermediate skaters who are working on their axels. You can pair the Jackson Debut, Premier Fusion and Elite models with the Ultima Freestyle or Ultima Legacy to get the most out of your skating equipment. The new Jackson DJ5200 and Jackson DJ5400 series boots are extremely lightweight and help advanced skaters land those triple and quad jumps. You can pair the new Jackson Elite and Elite Supreme series boot with the Jackson Ultima Matrix blades to help you jump higher and move faster on the ice. 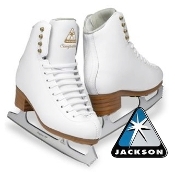 You can't go wrong with a Jackson ice skate, Jackson Figure skate or Jackson figure skate boot.